Our Therapeutic Massage School Asia is holding massage therapy courses in Singapore and Kuala Lumpur (Malaysia). We will also soon offer massage courses in Japan. Please contact us for dates, times and locations. All courses are from 9:00am to 5:00pm unless otherwise stated. The Asia massage schools of Brandon Raynor’s School of Natural Therapies have been offering massage courses for years now. The secret to the success of our massage courses is that we make our courses fun, very hands on, transformative, not very long and drawn out and the trainings courses are affordable too! Plus we teach a very powerful style of massage that encompasses the best of the major styles of massages available around the world. We include techniques from Remedial massage, Swedish Massage, Therapeutic Massage, Shiatsu, Thai massage, acupressure and deep tissue massage as well as Ayurvedic breathing techniques into one comprehensive style. The massage courses of our Therapeutic Massage School Asia is held over 5 days or 10 days. For more information about our courses please see our 5 day massage certificate course and the 10 day massage diploma course. 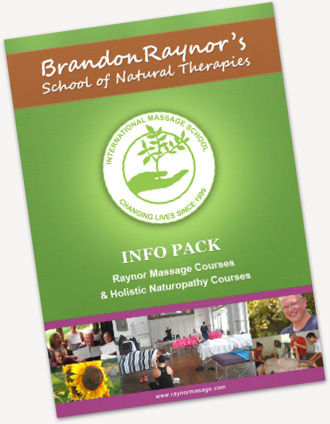 Learn about Brandon Raynor’s unique and revolutionary approach to massage courses. Details on what to expect from the Massage Certificate Course. Here’s a list of frequently asked questions. Hear what our students have to say about our massage courses. Brandon Raynor offers massage courses in many major cities worldwide. Brandon started his therapeutic massage school in the late 90’s in Australia. Learn more about the beginnings of Brandon’s massage school. Learn more about the world-wide expansion of Brandon Raynor’s massage school. Read about the foundation of Brandon Raynor’s massage education. All our massage training teachers are also experienced therapists themselves.